OSPF has been preconfigured for full connectivity. Configure router PRIMARY as the primary DNS server for domain “vault.local”. This router should use hostname ns1.vault.local. 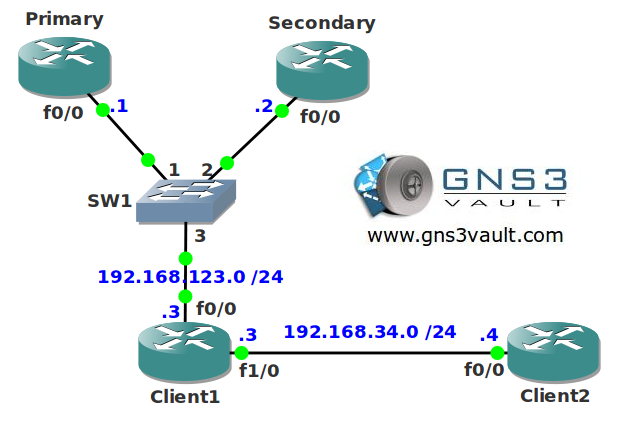 Configure router SECONDARY as the secondary DNS server for domain “vault.local”. This router should use hostname ns2.vault.local. Router CLIENT1 should be able to resolve the hostnames of the DNS servers. Router CLIENT1 should use both DNS servers by using round-robin. Router CLIENT2 should do DNS lookups by using CLIENT1. Configure a loopback0 interface on router CLIENT1 with IP address 3.3.3.3 /24. Configure the network so CLIENT1 responds with IP address 3.3.3.3 as a DNS response when the DNS servers are unreachable. You will learn all the secrets about DNS and more.